You know about Mables.com, but most people don’t know about our namesake. Meet Mable the Kitteh! We were super-ultra mega blessed to have this sweet cat in our lives from her birth in 1998 to 2005. If you were drawn to this page, we have a feeling you’ve experienced the magic of kitty love, too. Animals just lift us up, don’t they? Mable’s nickname was Horse Cat because she was so flipping huge! Tall, a little chunky, and with equally huge fangs and blue eyes. 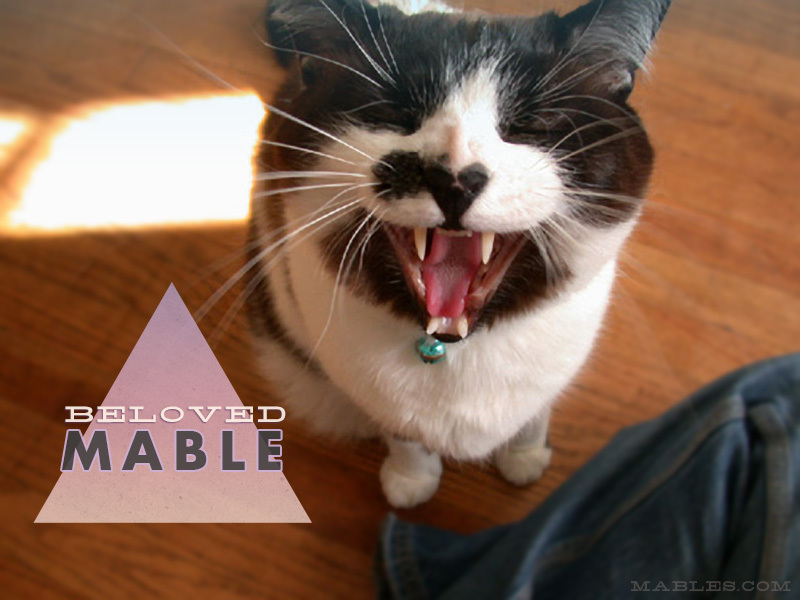 Mable was the most patient cat on the planet. Maybe ever. She would wait forever if you asked her to. Mable is a reminder that all cats must eat WET food in addition to having a constantly FRESH source of water. Mable passed due to hepatic lipidosis or “fatty liver”, which could have been prevented with that water-rich lifestyle. Cats have very delicate livers. When we see a cat being fed dry food, we remember Mable and share that life-saving knowledge. Mable the Kitteh was a gender revolutionary! Born male and possessing very feminine energy, we didn’t know until we took “her” to get spayed. (The vet said we should rename him Marbles. We didn’t find that amusing, nor did Mable.) Sometimes we referred to Mable as “he”. Sometimes “she”. Mable didn’t mind.